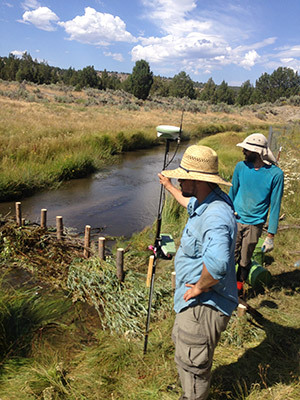 Scientists and undergraduate students used small boulders, wood posts and branches from nearby willow and juniper trees to construct analog dams, mimicking natural beaver dams. Matt Orr, an assistant professor of biology and Ron Reuter, an associate professor of natural resources at OSU-Cascades are leading the study on the South Fork of the Crooked River near Paulina where a team of five undergraduate students installed analog dams and measured soil moisture, stream habitat and water quality. To construct the dams, the team used small boulders, wood posts and branches from nearby willow and juniper trees, mimicking natural beaver dams. Their initial findings show how the dam of a beaver - the university’s mascot – can positively impact soil moisture and habitat for streamside plants up to 150 meters upstream. Because beaver have been eliminated from many lands throughout the West, particularly lands that have been impacted by grazing and agriculture, the research team’s work intends to provide a low-cost, low-impact approach to restoring stream and streamside habitat. By trapping sediment, beaver dam analogs also help to raise the streambed, which reconnects downcut streams to their former floodplains, increases “green space,” and reduces the destructive force of high flows. This spring and summer the research team will expand the monitoring to measure sediment, riparian plant health, and fish passage. The project was funded by an OSU Grand Team Challenge Grant, the Bella Vista Foundation and private donors.